Prepare your bookshelves! 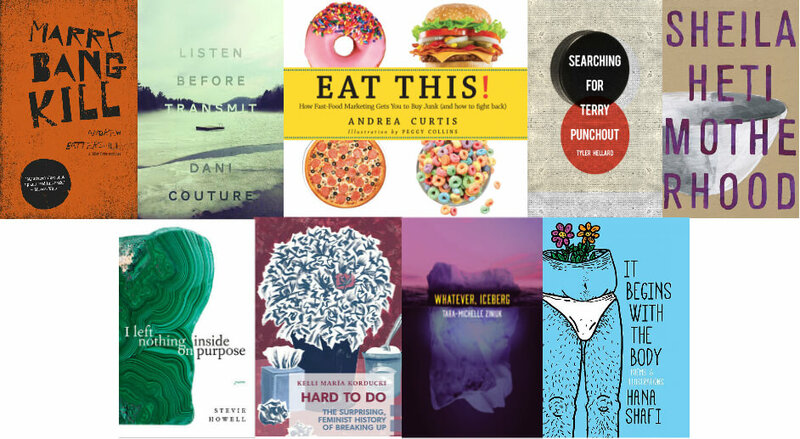 This year, This contributors past and present have been working hard to publish some incredible reads, including non-fiction, fiction, and poetry collections. Here’s what in store for 2018 from our friends at This—and you won’t want to miss any of them! Our fiction editor’s second novel is a crime-thriller that follows the tumultuous story of Tommy Marlo, a petty criminal who gets caught up with high-ranking members of a deadly motorcycle gang. He is forced to hide out in a small town where delinquency and mayhem unfold. Former This lit editor Dani Couture’s latest book of poetry deals with transmissions across space and time, and between one another. Her collection speaks to the limitations of our bodies, and searches for meaning in the cosmos. Andrea Curtis is a former This editor and current champion of healthy eating. Eat This! is a young adult non-fiction title that was deemed “fun and accessible,” by Jamie Oliver. It deals with the power of persuasion the fast food industry has using tools like ads, and product placement to control our eating habits. This alumna Rachel Giese explores the world of toxic masculinity among male youth in her latest book, aptly titled Boys. As feminism moves to challenge problematic stereotypes about femininity for girls, a movement with the same scrutiny among young men has yet to come to fruition. In Boys, Giese digs deep into the challenges boys face today and the ways we must overcome stifling misconceptions about masculinity. The debut novel from long-time This contributor and tech columnist Tyler Hellard follows the story of Adam, a sportswriter, who takes a long shot profiling an ex-hockey player/Zamboni driver Terry Punchout. Adam returns to his hometown in Nova Scotia in pursuit of the story, and ends up facing his complicated past. From This’s poetry editor, I left nothing inside on purpose meditates on the psychological weight of attachment with an almost devotional tone and fierce intimacy. Howell’s first collection was a finalist for the Gerald Lampert Memorial Award, and their work has appeared in national and international publications. In her non-fiction debut, Korducki examines what it means for women to “break up” in our modern culture, and how relationship mainstays from the past two centuries have got us to where we are today. A past This contributor and intern, Korducki weaves historical analysis with her own clever take on love and female agency. Our columns editor’s debut book is set to be published next spring after years of research (including a feature for This!). Andrew discusses the issues that arise from invasive species through the problematic lens of North American Asian carp. The book provides a narrative of changing fauna patterns as symptomatic of global environmental concerns. In It Begins With The Body, a collection of poems and illustrations, Shafi confronts her experiences as a Muslim girl coming into her own. Shafi, a former intern whose artwork and writing has appeared in This, addresses the pain and awkwardness in growing up with distinct, raw humour and unabashed honesty. Editor-at-large RM Vaughan has a phenomenal one-act play, One Year After, now out as a part of Frog Hollow Press’s New Brunswick Chapbook series. Tara-Michelle Ziniuk’s Whatever, Iceberg paints a lively, honest portrait of love in the digital age. She explores heartbreak, longing, expectation and bad luck with fearless humor and brave intimacy. A former This contributor and intern, Whatever, Iceberg is Ziniuk’s third collection of poems. A French translation of the book is forthcoming this year with publisher Triptyque.